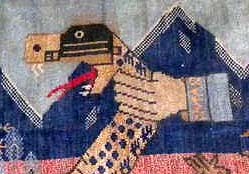 Such imagery (snakes, hands) is often used in carpets to depict evil, or power. In the context of the events of the last two decades in Afghanistan, this has become an impossibly enigmatic image. “Mullah Omar’s Face”, a recent article by Amy Davidson in The New Yorker, probes the reasons behind the secrecy that surrounds the identity of Mullah Omar. This echoes the secrecy surrounding his current circumstances, and references Steve Coll’s account of his current role in negotiations with the U.S. She illustrates her article with the four known photographic images of the Mullah Omar that are currently in circulation. One of these is a screen shot from a documentary Afghanistan Soldiers of Allah filmed by Peter Jouvenal and narrated by John Simpson for the BBC program Newsnight in 1996. This rare portrayal of the Mullah also has an extraordinary historical significance for the event it depicts in the minute or so of footage that still exists in the public domain. It captures an act with profound political and religious consequences, whereby the Mullah assumes an ultimate form of authority by the act of displaying the Prophet Mohammed’s cloak to the assembled crowd. 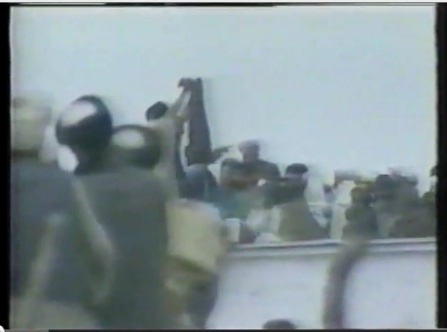 It shows the moment in the sequence of events where Omar (the central figure), who is standing on the top of the Shrine of the Cloak of the Prophet Mohammed, (Da Kherqa Sherif Ziarat) is shown turning to his right, holding the cloak, as an acolyte moves forward to kiss it, and others begin to throw their turbans forward in the hope that they might indirectly touch the holy relic. The sequence relating to the public disclosure of the sacred relic – the cloak of the Prophet Mohammed – is one of the most remarkable pieces of historical photography of the late 20th century. To film this scene at all was itself a transgressive act of the highest degree – later in the film we see how notorious were the Taliban for the brutality of their punishment for much lesser crimes. More than just a brave or foolhardy decision, this “image capture” may now be understood as a paradigmatic example of the way the photographic act itself may transcend mere documentation. In this instance the determination of the photographer to persist with filming the scene has resulted in the capture of a ceremonial event which, one could argue, was the first of a sequence of historical circumstances which was to culminate in the September 11 outrage five years into the future. 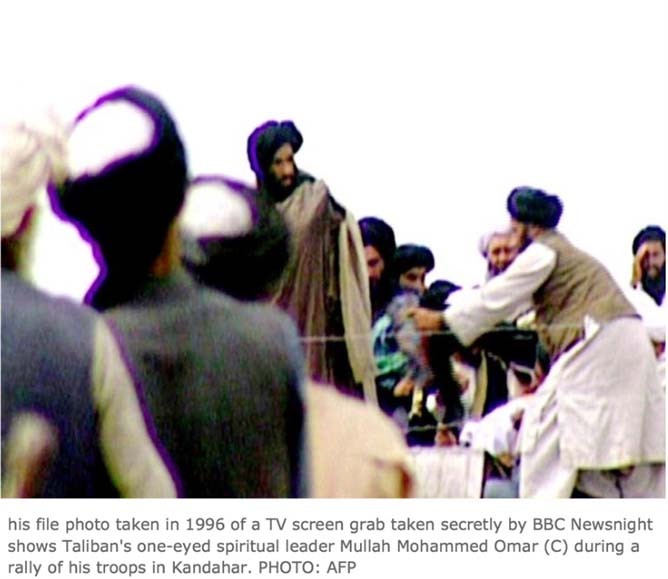 It is in the moments before we see Omar’s face that this prior image, where the Mullah is shown holding up the cloth for the crowd to see, is seen. This is the critical moment for its place in the history of photography. In this gesture, several things are happening at once. By displaying the cloak, the Mullah Omar is asserting himself as the rightful leader of the people of Afghanistan, both politically, and in religious terms. By this act he becomes the Mullah al-Momineen (Leader of all Pious Muslims). Reciprocally, the approving crowd is acknowledging the fetishistic and symbolic significance of the piece of textile held up for them to witness. It is the material presence – the actual matter – of the textile object that conveys the ultimate authority from the Prophet Mohammed to the Mullah himself through the political act of its possession and control. 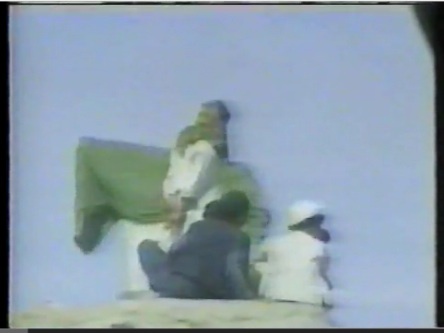 Earlier in the shot sequence one also sees a man – who may or may not have been the Mullah Omar – wrapping himself in a green cloth. As the story has evolved, this figure’s action has been interpreted (eg. see the Wikipedia entry) as if the Mullah Omar actually wrapped himself in the Prophet’s cloak. 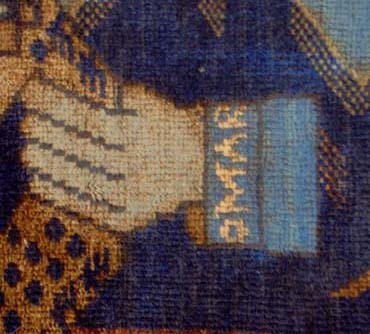 However in the later sequence the piece of textile the Mullah was holding aloft appears to be of a different colour, size and material. The photographic evidence – as it comes to us down the wires of the internet – simply does not tell us enough to reach this conclusion. Nevertheless, this photographic sequence poses entirely new challenges for our appreciation of this extraordinary point of coincidence between such disparate technologies and modes of iconic signification. If the authenticity of the relic is to be believed, which it is by those participating, this collision of cultures spans the millenia. From one direction, there is the secretive and forbidden intrusion of Western news media “behind the front lines”, and from the other, the revelation of one of the most holy relics of the Muslim world from its long seclusion from public view. It is a revelation of a revelation, each at cross-purposes to the other. The event of taking (stealing, shooting) the photograph is an act of disempowerment of the subject, whose own act of representation relies on the immediacy (and ephemeral) and uniquely experiential nature of his performance of revelation – which is, ultimately, invokes the presence of the Prophet. 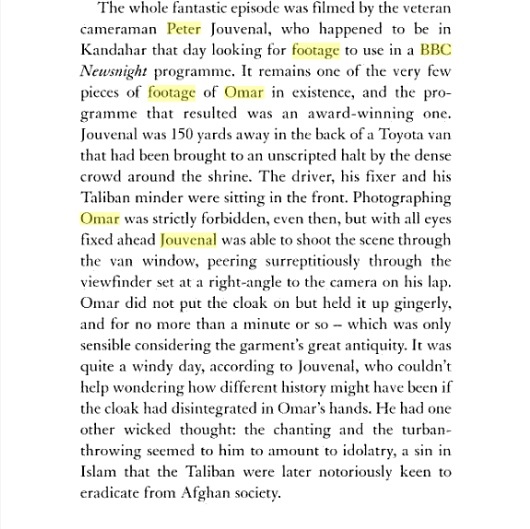 This is also a collision of technologies of representation: just as the camera captures the image of the figure of Omar, so at the same moment the Mullah claims himself to be the heir of the Prophet, through the agency of the piece of cloth. The cloth itself, despite its aniconic character, is held up for the crowd’s recognition and approval, and momentarily became the screen on which the power of the Mullah is projected by the adulation of the crowd and approbation of his peers. Just as the Mullah’s hand may be depicted choking the life of a serpent, so his actual hand, by holding the holy relic aloft to his audience, enacts a form of representation of his own growing political authority. P.P.S. There’s an update to the story here.